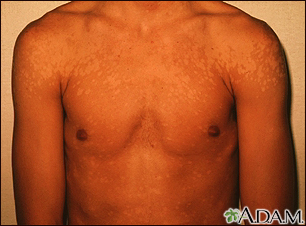 Tinea versicolor is a superficial fungal infection common in adolescent and young adult males. 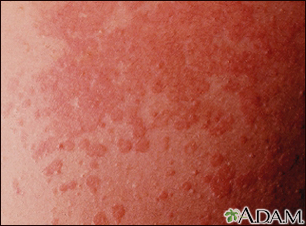 This close-up view demonstrates the typical pattern of the rash. Tinea versicolor is a superficial fungal infection common in adolescent and young adult males. Frequent sites of infection include the neck, upper chest, and axilla (arm pit). 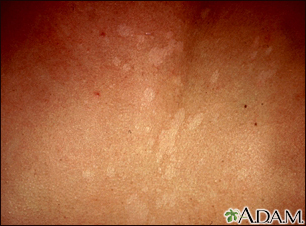 The rash may range from yellow to golden brown in color. Mild itching is also associated with this infection. This photograph demonstrates fairly extensive involvement. This is a fungal infection of the skin known as tinea versicolor, and is common in adolescent and young adult males. Besides the rash, there may be mild itching. Frequent sites of infection include the neck, upper chest, and arm pit (axilla). 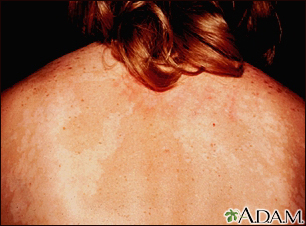 The rash may be white to yellowish to golden brown in color. A tan can accentuate the difference in skin color. Tinea versicolor is caused by the organism Pityrosporum ovale. It occurs most often in young adults. Wood's lamp examination revelas pale yellow-green fluorescence. KOH prep reveals "spaghetti and meatballs" with hyphae and spores. Skin lesions are sharply marginated macules, either hyper or hypopigmented, covered with fine scale. Small discrete lesions may eventually coalesce to cover large areas of the trunk. 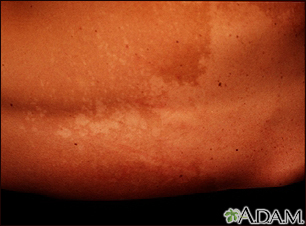 Tinea versicolor is fairly common. It is caused by a type of fungus called malassezia. This fungus is normally found on human skin. It only causes a problem in certain settings. The condition is most common in adolescents and young adults. It typically occurs in hot climates. It does not spread person to person. African Americans may have a loss of skin color or an increase in skin color. Your health care provider will examine a skin scraping under a microscope to look for the fungus. A skin biopsy may also be performed with a special stain called PAS to identify fungus and yeast. The condition is treated with antifungal medicine that is either applied to the skin or taken by mouth. Applying over-the-counter dandruff shampoo containing selenium sulfide or ketoconazole to the skin for 10 minutes each day in the shower is another treatment option. Tinea versicolor is easy to treat. Changes in skin color may last for months. The condition may come back during warm weather. Call your provider if you develop symptoms of tinea versicolor. Avoid excessive heat or sweating if you have had this condition in the past. You can also use anti-dandruff shampoo on your skin every month to help prevent the problem. Chang MW. Disorders of hyperpigmentation. In: Bolognia JL, Schaffer JV, Cerroni L, eds. Dermatology. 4th ed. Philadelphia, PA: Elsevier; 2018:chap 67. Patterson JW. Mycoses and algal infections. In: Patterson JW, ed. Weedon's Skin Pathology. 4th ed. Philadelphia, PA: Elsevier Churchill Livingstone; 2016:chap 25. Sutton DA, Patterson TF. Malassezia species. In: Long SS, Prober CG, Fischer M, eds. Principles and Practice of Pediatric Infectious Diseases. 5th ed. Philadelphia, PA: Elsevier; 2018:chap 247.